I hate to say this and it seems hard to believe but I think we, as a nation, have a ways to go before we hit the bottom of wherever the current leader is taking us. But we will hit bottom hard at some point in the near future. The question is: Will we care? Or will we even notice? That’s hard to say with so many of us already dull-witted and hypnotized from the administration’s propaganda machine that seems right out of Orwell’s 1984 with their own Newspeak in the form of Fox News and Sinclair Broadcasting and Doublethink in the form of their alternate facts. The Thought Police are will soon emerge in some form, no doubt. Something as seemingly innocuous as the leader’s wife wearing a slogan of apathy and dispassion– I Really Don’t Care. 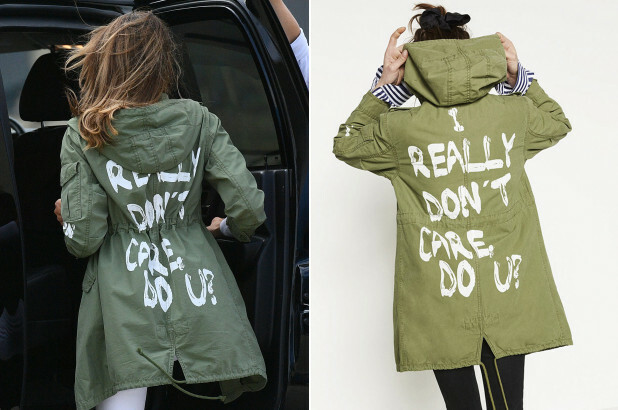 Do U?— on her jacket while on the way to visit immigrant children in traumatic situations takes on greater symbolic meaning in this environment. Some try to say it was just an overlooked fashion choice but that is disingenuous at best. These people know that their every word and action makes a statement. If not, then we are dealing with a stupidity and fecklessness that is beyond the pale. Myself, I think it may have been the most honest expression yet of this administration. They don’t care about immigrants, especially those who happen to be non-white. They don’t give a damn about coal-miners or autoworkers or farmers or any of the many other group whose asses they pretend to kiss while begging for votes. They don’t about you or me or humanity in general. They care only about power and all that comes with that power. Care. Now more than ever, stand up and be a goddamn human and care.